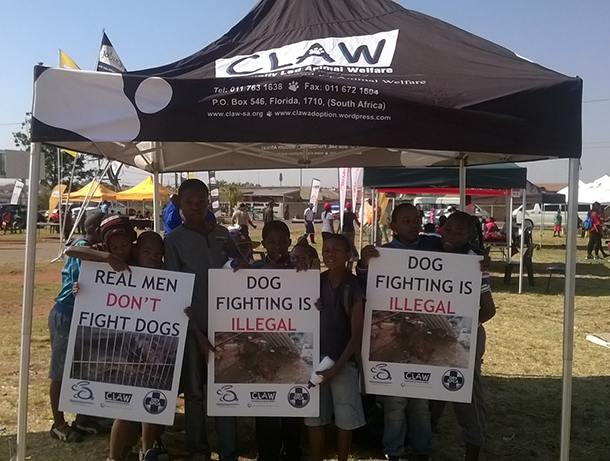 Nthabiseng Raditapole, Community Led Animal Welfare (CLAW) project Administrative Assistant and Education Officer, recently tackled the dog fighting issue at a community lifestyle expo in Soweto. She filed this report. On 27 September 2014, officials from the City of Johannesburg, and companies and NGOs providing services to the community came together at Doornkop hall in Soweto at an event to celebrate living a healthy lifestyle with residents and people from neighbouring townships. 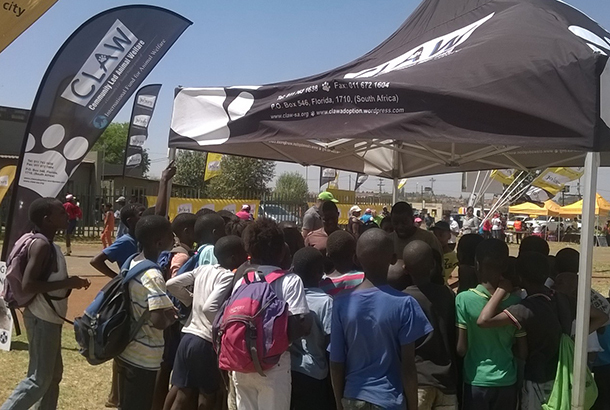 CLAW was the only animal welfare organization in attendance, and we are by far the organisation most actively involved with Soweto communities. CLAW has been providing free primary health care to pets and humane education in Doornkop since 1992, and CLAW hold mobile clinics there every Monday. CLAW must relocate its offices. Find out more. Having been educating this community about taking care of their pets and their pet health for years, we changed tune in 2014 to focus more on campaigning against dog fighting, which is rife in the community. There was never a dull moment at the CLAW stall as people of different ages came by for our education on dog fighting. They came in groups, one after the other. Mostly it was our target groups, mostly young boys and teenage guys, and occasionally older men and women who listened and gave their own opinions on the matter, and even reported areas where dog fighting is happening. Among other things all groups were taught that dog fighting is that it is not only cruel to animals, but it is illegal too. They were told that, even if you are just a spectator, you are as guilty as the people fighting the dogs, that one can be charged if caught, punished, and even get a jail sentence that will leave you with a criminal record that will haunt them for life, especially when you are older and looking for a job. It was emphasised that people who abuse animals in that way tend to find it easy to move onto abusing vulnerable people in society (small girls and older people) when it is no longer gratifying enough for them to just inflict pain to animals. We pleaded with them to work hand-in-hand with CLAW in putting to end to the horrendous act of fighting dogs. And they were warned that most boys that are associated with dog fighting end up using drugs, too. At the end of our education, we offered them phone numbers to report anonymously such acts. From the information gathered on the day we have identified six spots where dog fighting happens, and it happens mostly in the evenings on weekends starting Friday. Areas ranged from Doornkop, Swaneville, Braamfischer, and in Florida. Most people were surprised to hear that dog fighting is indeed illegal. Small boys and older women were most forthcoming with information than teenage guys. Even though teenage boys were attentive, they did not want to volunteer information. One teenage boy told me that it would be dangerous for him to give out such information. “I could get killed,” he said, and walked away. Some small boys complained that older guys were stealing their dogs to make them fight and that they even ambushed them on the road on their way home from CLAW’s mobile clinics to take away their dogs. We also learned of betting to the value of ZAR500 if one’s dog wins a fight. We still have a long way to go with the fight against dog fighting, I managed to get many of the small boys and girls to sign a pledge that they will not get involved in dog fighting and, if they can, they will inform us when they see it happening. Each of these youngsters was rewarded with an IFAW Animal Action Education water bottle after signing the pledge. Your support of IFAW efforts makes projects like CLAW possible. Consider a donation now.